Whether you're a newbie or a seasoned pro, Photoshop actions help you save your precious time and efforts required to edit photos. 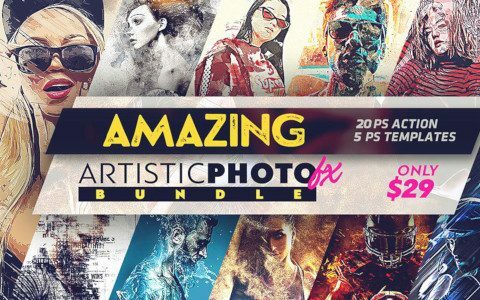 This Artistic Photo Effects Bundle gives you the ultimate head-start to improve your creative workflow with these easy-to-use single-click Photoshop actions. So go ahead and change the look and feel of your photos in a breeze! Buy it now for just $29. Let's Take A Look At These Amazing Artistic Photoshop Effects! *PS: These actions are not workable on Elements. For Just $625 $29 Today! DealClub Member??? Grab It For $21.75 Only! So far so good, easy to use, more like this would be great. Fantastic. Easy to use with just a click. Wonderful effects. I struggled with the tutorial at 1st, but once I figured out what I was doing… It was awesome!!! This plugin is well worth the cost. I am a total newbie to Photoshop and even I could use them easily without any issues. I had some doubts regarding the “aj” layer but the Dealfuel support team was quick to help me out with my doubts. Updating a previous review (which i see is not actually listed here) I initially had issues with the actions not working properly. Reaching out to the Dealfuel support I had a bit of back of forth to figure out the issue, however once it was worked out, I was able to run the actions with no issues. Looking forward to using this further to create some interesting images. The actions are very easy to use even and help you to create some cool looking images in an instant. If you are new to Photoshop just watch some free tutorials on Youtube regarding the actions and you are all set. Very nice and unique Photoshop actions! The amount of thoughtfulness put into these actions is just amazing. Never expected a Facebook deal to be so good! Still trying to perfect the actions (have only used two for now) after they run. Reviewed videos that came with the package but haven’t quite figured out how to make changes once the actions run,. I’ll keep practicing and reviewing the vids. This problem is usually caused by the photoshop program experiencing fatigue in running the action. – Clean the photoshop action file in the action box by deleting it. – Also clean the brush file in the brush box by deleting it. – After you do the above three things, please restart your photoshop, and run the action and brush as usual. – Please pay close attention to every instruction contained in “HELP FILE.txt”. I purchased this product for 3 of the actions included, so all I have tried are those 3 plus 1 more that caught my eye. They all work on Photoshop CC 2019, so that is great. And all 4 of them do work to a certain point. The reason I gave this only 4 stars is that the instructions on how to adjust the image after the action completes are non existent. Not being a PS guru I struggle to figure out how to reduce certain portions of an effect from the image. Fantastic. Easy to use, so far so good. Really great stuff its amazing what you can do with it! very valuable and time saving. and very very easy to use. I am still learning I hope to get it figured out. Having a ball with these. I used the Dust Explosion set to create some work of each of the artist of jazz band. This would have taken me a week to do without the action. Cut my time in half. And the more I use the faster I get the desired result. Love the creative software. Very easy to use. I am getting great results. Very fun to use. Easy to use, and with some tweaking and trial and error you can get some really amazing results! These actions are awesome and very easy to use. They have definitely shaved hours off the time it takes to replicate the effect manually. It’s fun to play with all it can do! The effects are really fun and easy to use. Just have a look at the images above and you’ll recognize what an amazing kit you got here. Even people who use Photoshop on a daily basis have to acknowledge that this bundle can simplify their workflow when it comes to composing. Can recommend a purchase 100%! A Great Effects and easy to follow instruction to use. It mesmerize the viewer definitely. Still practicing to get it just right. Nothing published on my DeviantArt yet but coming soon. I like the stuff very much. It invites you to experiment and explore your creativity. You’ve gotta know Photoshop but if you know it, it’s easy peasy. Very nice effects. Easy to use! My personal favorite is the water color. There is a LOT of complex work behind these actions–the result is that it saves YOU an incredible amount of time. However, if you are new to Actions or to Photoshop, you need to read the instructions very carefully. I kept getting some error messages, only to realize my jpeg file was too large. I passed over that piece of information in the instructions. (Max pixel sixe is 3500 px wide.) But if you don’t rush (we seem to be in the drag & drop instant creation mentality) and follow the instructions, you’llhave some great results. Awesome effects and extremely easy to use and well documented. Even has video tutorials! Thanks to the creators of this excellent bundle. The only reason I cannot give this product 5 stars is because I’m still learning it. If you read the instructions you can create some amazing work. I look forward to learning more.